Running outdoors is not always an option due to weather or location, but when given the choice it might be a better option than running on a treadmill. Why? Because the treadmill just doesn’t make you work as hard. The treadmill does have its perks however. Here are a few things to keep in mind from each angle. One way that running indoors on a treadmill is different than running outdoors is that you don’t have to think about the pace that you’re running. When you’re running a treadmill you obviously set a pace and then match it, which means that you don’t have to pay attention to keeping your own pace. If you try to train on a treadmill for an outdoor run without paying attention to pace you might not be as comfortable with your pacing when you do head outdoors. Pacing is extremely important when you’re covering long distances so that you don’t tire out too quickly or take too long to complete the run. Outside there are different elements that create a lot of natural resistance, such as different levels on the ground and the wind. Even when you feel like you’re running on flat pavement there are still unknown factors that slightly change the work that your body has to do. Less of this happens on the treadmill unless you’re actively changing the resistance throughout your run. For some people running a treadmill is simply not as exciting, which might mean that you either don’t put in as much effort in your workout or you might not even workout as long. When you have a set distance that you need to cover outside to make it to your end spot you pretty much have to keep going. Even if you’re doing loops it’s generally a lot easier to see the finish line than it is if you’re running on a treadmill and staring straight ahead. For some people running on the treadmill also means watching TV which is a good way to pass the time but has its issues as well. When you’re totally zoned out you’re not paying as much attention to what your body is doing or why so you might not be progressing at the same pace. If you have to turn your head at all to see the TV screen you might be throwing off your back alignment, which can turn into some issues down the line. Holding onto the side bars while you run is always a no since it will cut down on your effort. Those are reserved for loading and unloading. But of course, the treadmill isn’t all-bad. It’s a way more convenient option for some, which means that it’s better than nothing. 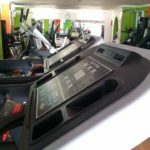 The key is to train on a treadmill similarly to how you would outdoors when you want to get the best workout possible. That means making sure that you’re using the proper form, keeping track of pacing, and committing to certain times or distances.